The last time South Africa and Great Britain met was at IC11. South Africa won by 36 points. At IC14 the teams did not meet. But their fortunes were very different. South Africa narrowly losing to NZ in the 3rd/4th place playoff and Great Britain finishing ninth. So there was not a lot historically to suggest that the outcome would be anything but a South Africa win today. In retrospect we know that South Africa were touch and go to come to IC17. Growth of football in South Africa seems to have stagnated. On the other hand a bullish Great Britain has seen football grow not just in London but outside London, particularly in the North of England and in Scotland (both men’s and women’s footy). So perhaps today’s result does reflect the state of the game in each nation and thumbs its nose at history. It was a good game to watch. Right from the start both teams were ready to go. And hit hard they did, and tackle, and run. The pace was frenetic, you were waiting for one side to give in but that did not happen. GB had the wind in the first quarter and Andrew Walkden was the only goal scorer, goalling twice. 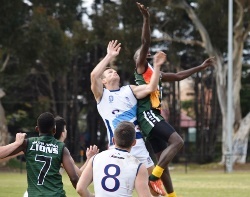 South Africa to ran the ball into the breeze, but up forward could not make their marks stick and Bulldogs defenders like Sean Walton and Myles Hudson were able to rebound. The Bulldogs were wasteful up forward though and 2.7 looked like it might be costly in the end. With the breeze the Lions found the going a little easier, with kicks carrying longer. Steven Matshane kicked their first. Walkden has chance for his third at the other end buy his snap missed and though they looked dangerous into the breeze too, they managed just three behinds for the quarter. Mimasa kicked South Africa’s second and left the Lions just seven points down at half time. Credit has to go again to the GB defenders and on ballers such as Luke Matias for working to hold back the tide. 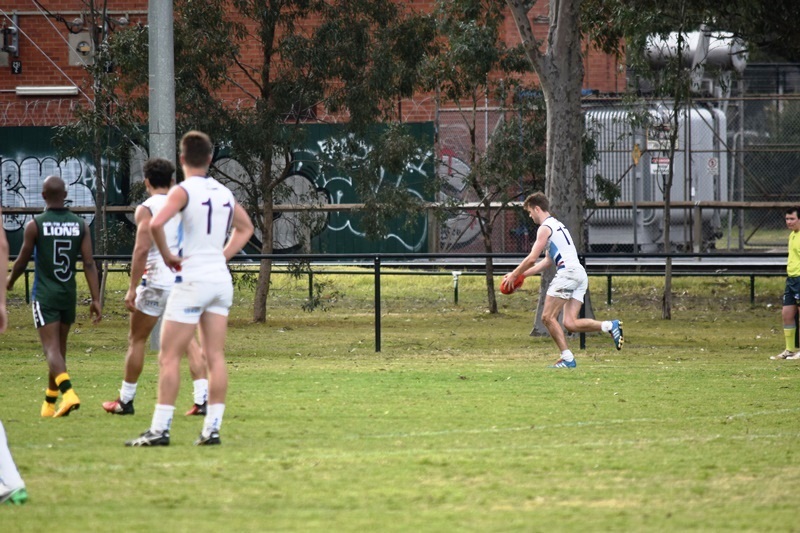 With the breeze again and knowing they had to get on with the Bulldogs pressed hard, Walkden capitalised twice early in the third quarter, being at the right place roving the pack contest for a goal and then being close to the line when the Lions player dropped a high ball in the goal square and booting the ball through. When the Bulldogs added another something needed to be done. Tshoboko Moagi, the man they call Hippo, was doing everything he could to get his team back into it both with the ball and doing the team things around it. And it was looking like it was working. South Africa were getting the ball inside 50 into the breeze, and setting up well to lock it in. Late in the quarter Soyoki kicked one for the Lions after marking just outside the goal square. 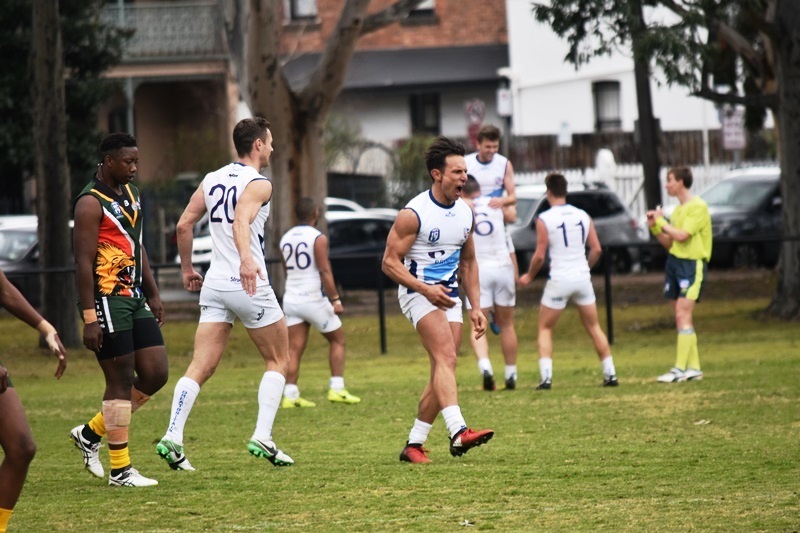 It left the Lions on a high at three quarter time, just fifteen points down and with the breeze behind them for the last quarter. But it is a common mistake for teams to think that the breeze will do the lion’s share of the work. The margin was reduced to just 3 points early on in the last quarter when Matshane made no mistake from straight in front. But the rest of the quarter was to be a Bulldog party. Jack Coughlan kicked two for GB the first marking at the top of the arc and kicking truly and the next taking the ball off the pack and swinging it home. 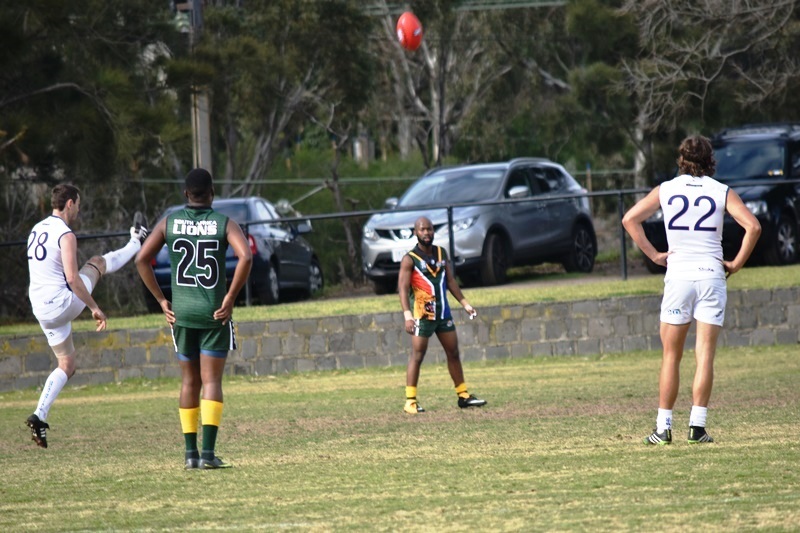 Ryan Floyd got in on the act and marked the ball over the back of the contest in the goal square and converted truly. If was fitting that Walkden put the final nail in the coffin of South Africa when gathered the ball in the pocket on the run, side stepped the South African defender and drilled it through for full points. Jubilation for the Bulldogs, the bench able to breathe easy with a couple of minutes to play. South Africa’s players looked to have trouble through the match both in holding their marks and keeping their feet and looked like a rusty version of their 2014 selves. They have little time to lick their wounds as the big Americans will be waiting for them at Wesley College on Wednesday. The Bulldogs need to carry today’s intensity into their match (against a Canadian team that lead the US at half time today) at Officer.